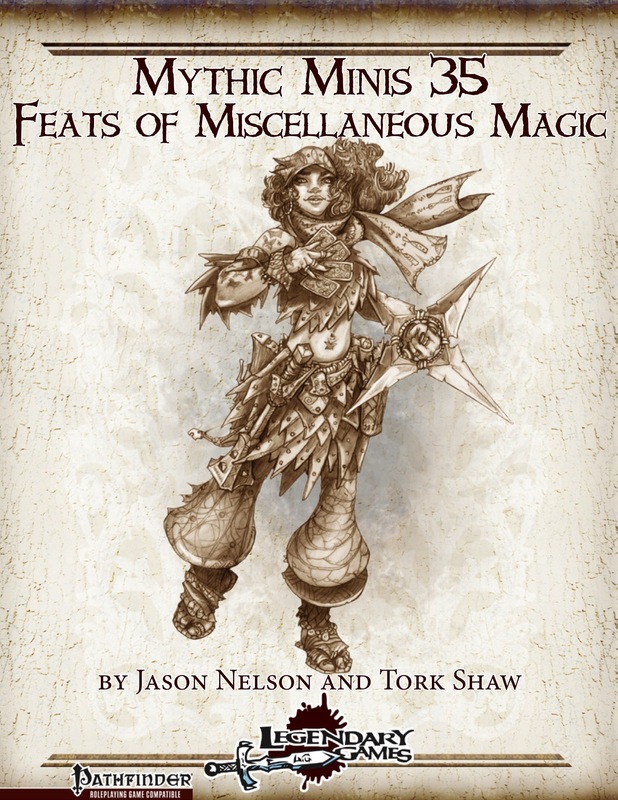 Feats of Miscellaneous Magic brings you 10 mythic feats for all manner of magicians, whether summoning support or studying sacred scrolls to learn the latest legerdemain, from witchcraft like Split Hex and Starlight Summons to dedicated study like Arcane Talent, Preferred Spell, and Tenacious Transmutation. All right, you know the deal - 3 pages - 1 page front cover, 1 page SRD, 1 page content, let's go! -Arcane Talent: +1 0-level spell per 2 mythic tiers; slightly increased CL and cast cantrips as SPs. Okay, I guess. -Diviner's Delving: Increase CL by mythic tier; also, receive concentration-based info sooner; also, use mythic power to maintain concentration as a swift or move action. -Preferred Spell: Change preferred spell whenever you rest; spend spell level mythic power to cast the spell even if your spells run out. Okay, here we have a massive wording issue: As written, this feat could be read as "spend mythic power upon choosing the spell equal to spell level to cast it even when your slots run out"- which would mean infinite spells, which, even in mythic adventures, are just not cool. Not gonna happen anywhere near my game. Now I know that this feat *means* that one can spend x mythic power to cast the preferred spell ONCE, which makes sense, but as written, it could be read either way. Some slight rewording can get rid of this issue. -Sacred Summons: Faster summons if they match your aura; any creatures you summon receive the benefits of a protection from...-spell. Also, for mythic power, double duration of summon that matches your alignment. -Spell Hex: Replace spell selected with base feat with any spell of 2nd level or lower. Expend mythic power to change the spell. Nice versatility boost. -Split Hex: Larger reach for split hex's second target; also, choose which has to save first, second receives -2 to save. Here a bit odd - "If the first target's save is successful, the second target receives a -2 penalty on its save." But I can determine who saves first? So does that mean, that if I choose the second target to save first that the first target receives the penalty? Or only the other way round? Cosmetic, yeah, but still, slightly confused wording. -Split Major Hex: As the regular Split Hex, but more powerful and for mayor hexes. Same slight wording issue applies. -Starlight Summons: Creatures summoned receive an entropic shield and add faerie fire to crits. Cool! -Sunlight Summons: Creatures summoned shed daylight and blind foes on a crit if they fail their save. Again: Cool! -Tenacious Transmutation: DC to dispel or remove your transmutation further increases; also: higher chance to bypass SR. Where this becomes really cool, though, is with the effect to retain some benefits from transmutations that were dispelled - damn cool! -Theurgy: For arcane spells sacrificed, +CL-increase equal to spell-level sacrificed, up to a maximum of mythic tier. For divine spells + mythic tier x spell-level holy damage...which does not exist. There is no "holy" damage. EDIT: I've been made aware that the base feat has this error as well. I was already aware of that. This does not make this any less glitchy, just a reproduction of a glitch in the base feat. -Uncanny Concentration: No need to make concentration checks while being grappled or entangled. Also, receive a bonus equal to +1/2 mythic tier to concentration and spend mythic power for +20 on concentration. Okay, flat-out immunity, plus vast bonuses to a roll seldom enhanced by anything + almost auto-win for mythic power? Yep, this feat is overpowered, even for mythic adventures, and needs a whack with the nerfbat. Editing and formatting are very good, I noticed no significant glitches. Layout adheres to Legendary Games' 2-column full color standard and the pdf has no bookmarks, but needs none at this length. Tork Shaw and Jason Nelson deliver a nice array of feats herein, with some true gems herein, but also some wording in need of filing off of the edges; And then there is the non-existing damage-type and utterly broken autowin-concentration-trickery in need of nerfing. My final verdict will clock in at 3.5 stars, rounded down to 3 for the purpose of this platform. Reviewed first on endzeitgeist.com, then submitted to Nerdtrek and GMS magazine and posted here, on OBS and d20pfsrd.com's shop.